In warm mocha, this adorable short chiffon homecoming dress includes a removable rhinestone belt that changes the style according to your mood. Wear the shimmering belt for an eye-catching look in this pretty party dress, or simply remove the belt for a more demure fashion. With a deep v-neckline that is mirrored in back, the sleeveless bodice boasts embroidered lace applique that provides a gleaming texture. Fully-lined, the short chiffon skirt flares away from the hips to flatter the figure and complete the look of this sweet short chiffon homecoming dress. 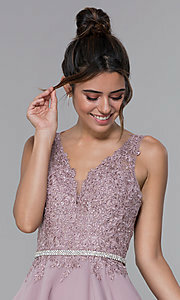 This semi-formal party dress would be equally ideal for wedding receptions, holiday parties, or hoco 2019.